There’s plenty of excellent English-language content being authored on Japanese and Asian baseball. Here are links to a few examples. Wayne Graczyk of the Japan Times discuss’s the Central League’s consideration of having teams announce their starting pitchers in advance, as opposed to the keep policy of keeping them secret until lineups are exchanged prior to each game. Such a policy shift would put an end to the teisatsu member tactic of inserting a player in the lineup, immediately to be removed once the opposing starter is known. John E. Gibson of the Daily Yomiuri has an update on pitcher DJ Houlton, who moved from Softbank to Yomiuri this offseason. A message thread on JapaneseBaseball.com lists this year’s KBO foreign players. I occasionally get asked about this, so it’s nice to have this list. Jason Coskrey of the Japan Times looks at Yomiuri’s offseason decision to effectively swap Alex Ramirez for Shuichi Murata. Upon the news of Marc Kroon’s retirement, Coskrey tweeted a link to his 2009 story about Kroon’s Nippon Series performance. JapaneseBaseball.com founder Michael Westbay has been contributing articles to the bible of Japanese baseball, Baseball Magazine. He’s posted his most recent in English to Google+. I’m always on the lookout for new blogs and sources of content on Japanese baseball. If you know of any that I don’t link to, let me know. It’s been a while since I’ve done one of these. So long, in fact, that the draft post had some links from July in it. Between when I started this and now, some interesting random things have happened. Here are a few of them. The Orix Buffaloes promoted Freddy Ballestas to their shihaika roster back in July. Also in July, Softbank lefty Tsuyoshi Wada took home his 100th career win. He achieved the feat in his 200th career game, the eight fastest pace of all time and the fastest for a lefty, ahead of teammate Toshiya Sugiuchi. In other Wada news, Tsuyoshi reached the service time requirements for free agency on September 16 and is widely expected to make a run at an MLB contract this offseason. Said Wada: “I’m honestly happy [about reaching free agency]. I haven’t had a chance to think about it yet. [The team and] I haven’t had a detailed discussion yet, but I’ve been told I’m needed.” He looked pretty happy about the achievement. Hiroshima is holding a tryout on September 24th, for men aged 17 to 24 and over 175 cm tall. This is aimed at Japanese, NPB draft-eligible players. Sport Hochi speculates that Yokohama could release all eight of their foreign players this offseason. I suspect they’ll hold on to their Taiwanese prospects but move on from the rest. Whomever runs the official Orix Buffaloes Twitter feed wants to attend UEFA Champion League matches. Journalist Misako Hida recently did an interesting interview with Kei Igawa for the Japanese version of the Wall Street Journal. Among the insights: Igawa wants to sign with an MLB organization that will give him a chance to reach the majors, he doesn’t get recognized much when he goes out, and he realized the Yankees didn’t know him when the GM and manager asked what his best pitch at a meeting during his first year. @mykbo had a Tweet this morning saying that Lotte pitcher Lee Yong-hoon has thrown the first minor league perfect game in the history of the KBO. Twins blog Over the Baggy has some interesting analysis of Tsuyoshi Nishioka’s defense in his first year with the Twins. The author makes some excellent observations. Better, I would say, than anything I’ve done in this area. When I started this site in 2008, there were some good English language sources of information on Japanese baseball, but I (obviously) didn’t feel there were enough. Thankfully, there are a few more now. So here’s my guide to the English NPB Blogosphere for 2010. JapaneseBaseball.com, the first there ever was, hosts blogs as well as discussion boards. By know we know what to expect from Deanna’s Marinerds: baseball otaku-ism, lots of detail, and great photos. Similarly, if you’re reading this you’ve probably seen Yakyu Baka, Gwynar’s insanely thorough news site. Gary Garland no longer posts news to Japan Baseball Daily, but stats and archived content are still available. Simon appears to be on a little bit of a hiatus, but he occasionally covers baseball at jhockey. His hockey content gets a thumbs up from me too. Japan Baseball News is a new site that got going last season. Japanese Baseball Cards makes me miss Calbee Potato Chips. Kokoyakyu is an invaluable resource during the Koshien tournaments. I haven’t found it’s equal in Japanese (not that I’m looking). Janblurr’s blog includes the occasional post on Japanese baseball. Jan also contributed this post about German baseball to NPB Tracker last year. Tsubamegun, a site dedicated to the Yakult Swallows is the veteran of this bunch. We Love Marines appeared on the scene last season. I bet you can guess which team that one is about. Where Eagles Dare is another relative newcomer with an similarly eponymous name. Steve Says Kampai! and follows the Hanshin Tigers. Christopher’s Tiger Tails, hosted by JapaneseBaseball.com does as well. Michael Westbay’s Bayside West covers the Yokohama BayStars. Rob Fitts chronicled the famed 1934 MLB All-Star tour of Japan, which is really what gave professional baseball its start in the country. Rob isn’t maintaining that particular story line any more, but its still a great read. A Noboru Aota Fan’s Notes is only an occasional read for me, but it’s really a remarkable site. The very anonymous author goes into a tremendous amount of detail on each topic he covers, and includes scans of old photos and painted baseball cards. Really enjoying this site requires a decent investment of time, though which runs counter to the Internet culture. Still, this is a hidden gem. East Windup Chronicle has made a triumphant return. True Stories of Korean Baseball is my go-to source for KBO news, and written by a fellow expat Chicagoan. Taiwan Baseball always has the latest on MLB prospects from Taiwan. Reader Dan has alerted me to the presence of his English-language KBO forums. I don’t link to writers in Japan’s mainstream English press very often, but there are some who do excellent work. Three that I think deserve special attention are Jim Allen, Jason Coskrey, and Wayne Graczyk. If there any sites that are missing from this list that should be included, please leave a comment. Ryan Sadowski has found his way to Asia. The former SF Giant has signed a deal to pitch for the Lotte Giants in 2010. You might recall that the Yokohama BayStars tried to get Sadowski during the 2009 season, but San Francisco decided they could use him on the big league roster and held on to his contract. Sadowski had a couple of good games at the MLB level before Jonathan Sanchez returned from bullpen exile to throw a no-hitter. Sadowski had signed with Houston earlier in the offseason, but I guess the Astros let him out of his contract. Best of luck to Ryan in Korea! Japan’s answer to the Arizona Fall League is the Miyazaki Phoenix League, a 17-day long instructional league held in southern Japan. However unlike the AFL, the Phoenix League is not only a place for prospects to gain experience, but an opportunity for the stars to prepare for the playoffs. Hisanori Takahashi recently pitched four innings in a Phoenix brush-up start and Yu Darvish plans to join Nippon Ham’s Phoenix team to rehab from injury. The Miyazaki Phoenix League consists 12 NPB teams, the Futures team (consisting a mix of NPB farm players), the Hanwha Eagles and Doosan Bears of Korea, and an All-Star team from the Shikoku-Kyushu Island League. The 16 teams will play a total of 112 games. Even though the fall league started out with all games being cancelled due to a typhoon, the fans have had many opportunities to interact with players and it’s been a special time for this sports-deprived region of the country. Small cities in Arizona and Florida are the mecca of baseball during the spring and it makes sense for the NPB to construct their instructional leagues in different regions during the offseason. 17-days long tournament can bring a financial surplus for rural Miyazaki and even though some of the teams are concentrating on the playoffs, it is the best time of the season for the baseball fans in southern Japan. Starting from 2005, the Asia Series was once thought to be the next big tournament in Asian baseball. However after four years, the tournament was unable to catch sponsor’s interest and with financial difficulties it was decided to rethink the tournament this year. 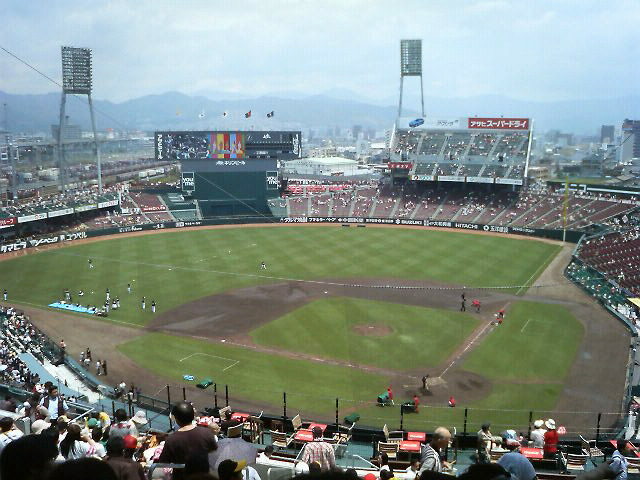 Now as a replacement plan, the NPB and KBO have agreed to hold a Japan-Korea Club Championship on November 14th at Nagasaki at the Big N Stadium. The champions from the NPB and KBO will play to decide the champion of the two leagues. Kazuhiro Kiyohara made his first appearance in a Seibu uniform in a while, swinging through the ceremonial first pitch on August 22.I’m not sure what Kiyohara’s been up to since retiring, but it looks like it involves getting a tan. Hanshin is scouting Korea, reportedly looking at Kim Tae-Gyun of Hanwha and Lee Taek-Keun of the Heroes as potential acquisition targets for this offseason. Lee Bum-Ho and Kim Dong-Ju are also drawing interest from NPB teams. Someone who knows better should check my Romanization of these names. Yakult’s Norichika Aoki, in the midst of his worst season as a pro, had his first four-hit game of the year, bringing his average up to .278. Yakult lost the game 7-3 to the Giants. Draft Reports has a list of the hardest-throwing pitchers in this year’s Koshien Tournament.Yusei Kikuchi, Takumi Akiyama, and Kenta Imamiya. We tweeted the news that Yu Darvish will skip his next start. Matt visited Starfin Stadium in Hokkaido recently. Deanna went to an Island League game, and sends pictures. Gen gives us a look at Japan’s entry in to this year’s Asia AAA Tournament. Jim Allen finds out what makes Takuro Ishii tick. Non-baseball item du jour: researchers at Tokyo University have developed tangible holograms. Graphics are the area of computer science that I find the most challenging so I’m quite impressed by this. Sponichi is reporting that Ken Kadokura is heading to Korea to sign a deal with the SK Wyverns. The Wyverns were the first team to make Kadokura an offer after he was released by Yomiuri, but he chose to pursue an MiLB contract instead. SK also has former MLB’er and SoftBank Hawk CJ Nitkowski under contract. For more on Kadokura, please read this earlier post.